A ‘Final Theory’ of God shows that science, philosophy and religion are all saying the same thing, only in different ‘tongues’. 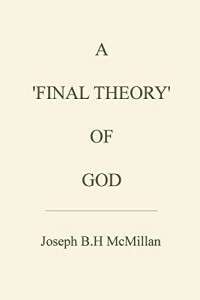 Joseph BH McMillan, a lawyer by training, subjects the scientific, philosophical and religious evidence for and against God to a rigorous legal methodology, and concludes that on the highest standard of legal proof, the evidence confirms the existence of God beyond a reasonable doubt. McMillan opens a view to an entirely new philosophical and spiritual landscape by awakening the human spirit to its true moral purpose, and its true moral destiny. Anyone reading this book will never think about science, philosophy and God in the same way again. 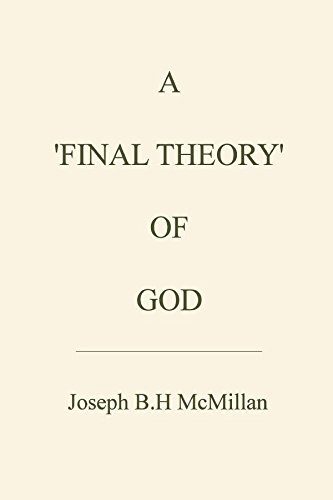 “I found [McMillan’s] arguments based on physics for the existence of a god quite compelling.” Professor Vaughan Pratt, Professor Emeritus at Stanford University. Joseph BH McMillan recently joined Midpoint host Ed Berliner on Newsmax TV to discuss his new book. Watch the interview here. We do not build a Temple of Freedom by stacking one Right on top of another like bricks; instead we build ourselves a prison, a prison governed by a Tyranny of Rights. There are only Ten Principles that can guarantee our individual and collective freedom. Anything more, or anything less, creates inequality and oppression. From these Ten Principles emerge everything we recognize as ‘morality’. They also form the foundation of the entire concept of human ‘obligations’. And these Ten Principles give substance to those worn out and distorted concepts known as ‘justice’, ‘tolerance’, and ‘equality’. 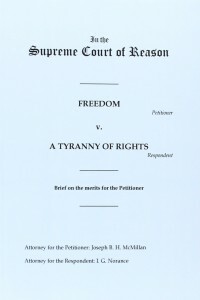 This work presents our generation with a stark choice: Freedom, or a Tyranny of Rights? How we respond to that choice will determine the character of Western civilization for future generations. The choice we face is far too important to be left to politicians and academics. Each and every person will have to take their stand for Freedom, or surrender to the ever encroaching Tyranny built on a proliferation of ‘Rights’. But most important of all, this work shows that the Ten Principles of Freedom are also the ‘secular’ counterpart of the Ten Commandments, thus sweeping away the artificial and dangerous distinction between ‘secular values’ and Scriptural values; a distinction that has created the modern schizophrenic Liberal Fundamentalist State. There must be more to life than the relentless toil to replenish the bank account. That is the theme of Escaping Britain. Many of us dream of packing up and setting off into the sunset to find a new life; Campbell and his family did it. 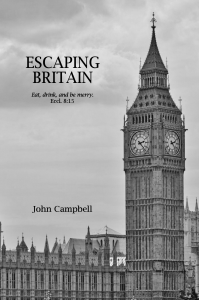 Campbell had simply had enough of the stifling political correctness that was gripping Britain. The tipping point was a run-in with his bank’s new fangled ‘financial advisors’, intent of squeezing every last penny out of him, followed by a meeting with some troublesome clients. Campbell and his family sold up, bought a tent, and drove off to find a new life. Here he documents their travels through France and Spain, sampling the wonderful cuisines and cultures, and his journey of self-discovery. Funny, entertaining, and enlightening. Written under the pseudonym ‘John Campbell’ and originally published by Escaping Books S.L in January 2007. Current edition published in November 2014.